Welcome to the Burnouts section of Fast Cool Cars. 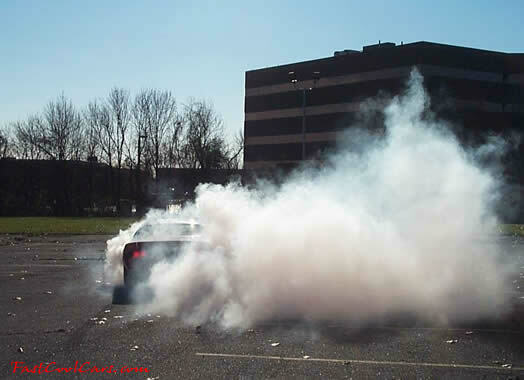 Here you will find many pictures of different cars doing burnouts, like Chevrolet, Ford, Dodge, Buick, Honda, Toyota, Mitsubishi, Nissan, Mazda, Cobra, Lamborghini, BMW, Pontiac, Mercury, and many more. There are rear wheel drive and front wheel drive cars. We also have trucks and motorcycles. FastCoolCars.com does not promote the practice of doing burnouts, but knows that it will and is being done, and lots of people want to see the pictures of them, so send in your pictures for the rest of the world to see. Good promotional section for tires like Goodyear F1 Eagle ZR rated, Firestone Firehawks, Kumho, Dunlop, BF Goodrich, Pirelli, Bridgestone, Falken, Hankook, Michelin, Toyo, Yokohama, and others.